Kongo travels more than 200,000 miles on domestic flights within the USA along with a few passport-stamping expeditions overseas each year. As a very frequent flier, recurrent car renter, and serial hotel guest he has picked up a few useful tips and pet peeves about navigating airports, airplanes, rental car counters, hotel check-ins, and getting around in strange places. This will be the first of a series of blogs about how to behave in today’s travel jungle that will help you enjoy a happier, healthier, and more rewarding travel experience and contribute to world peace in general. This first in this series is an airport “how to” because most of us start our journeys at the airport. Here we go. Airports. Everyone says how much fun flying used to be before the advent of the TSA security checks, deregulated airline fares, cramped airline seats, rising fuel costs, fees for checked bags, and the banning of liquids in carry on luggage. Kongo still thinks flying can be as much fun as a barrel of say…monkeys, but you have to follow the rules and the rules come into play as soon as you arrive at the airport. So follow the rules and avoid going, well you know, ape**it! Check in and boarding passes. Hello everyone, it’s 2012 already! Check in online and print your boarding pass at home or at your hotel (every hotel now has a free computer for printing out boarding passes) and avoid the lines at the ticket counters. Better yet, follow Kongo’s lead and get one of those nifty apps on your smart phone and skip the whole printed pass thing. (Although Kongo does have a paper boarding pass backup in case his iPhone dies, gets lost, the wireless signal goes south, or the scanner at the TSA checkpoint is on the fritz. 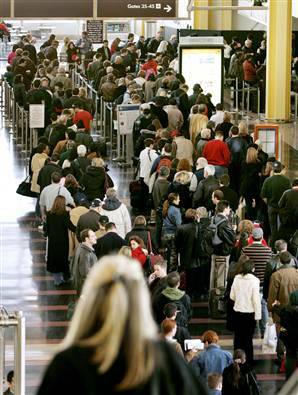 Airport security procedures change frequently. It has something to do with keeping the bad guys off guard so if you don’t fly that often check the TSA website for the latest rules about prohibited items, traveling with children, medications, identification, liquids, disabilities, and pat downs. Being clueless is no way to go through life and those standing behind you in the security line will appreciate your savvy. Speaking of Security Lines. You’re probably going to have to go through a scanner. Get over it. If you don’t want some stranger looking at your “naked body” (as if most of us have a body someone really wants to drool over) you can opt for a pat down which will add about five minutes to your passage through the lines and cause everyone to look at you strangely. Please avoid being a drama queen (or king) and talking about “junk” or the fact that you stormed the beaches in Grenada and should be exempt, or protesting that grandmothers shouldn’t be humiliated like this. Rules are rules are they weren’t thinking of you specifically when they came up with what we have to go through now. Remember that your goal is to get on that airplane not to tilt windmills with the poor TSA agent who is only doing what we pay her to do. Along those lines, joking about bombs (yes, Kongo has heard these in a security line), deep sighs, eye rolling, mutterings, cursing the system, complaining about the government, and other acts of general rudeness are not only unbecoming and probably contrary to your general nature (Kongo always assumes most travelers are nice people underneath all that bravado and posturing) they can get you into a lot of trouble and could prevent you from getting to where you want to go. When you get scanned you will have to take off your coats and jackets, shoes, fashion scarves, most jewelry (including watches), belts, and remove EVERYTHING from your pockets. Kongo has read about women who have stripped down to their underwear as some sort of protest against TSA but alas, has never been able to actually see one of these…except for one weird event shortly after 9/11 at the Providence RI airport but that’s another blog entry altogether. Keep the security line in mind when you consider the fashion statement you’re going to make on your travels. Knee-high lace up boots may be exactly the look you want to give to your boyfriend waiting anxiously at your final destination but it’s really going to annoy those gentle travelers behind you. Slip on shoes is the way to go here. Easy off, easy on, and you keep the line moving. Suspenders (especially those nerdy clip on kind) won’t fly here. Bangles, body jewelry, fancy necklaces, and other fashion accessories should be stowed safely in a little zip up bag you can put in your roll aboard or brief case and don on the OTHER SIDE of the security line. And for men with certain physiques (you know who I’m talking about) be sure that when your belt comes off that your trousers stay where you want them to which is roughly around your waist. And if your pants have a tendency to slip down when you bend over (you know what I’m talking about) take your shoes off BEFORE your belt so that you don’t have to bend over and provide us with a view of your you-know-what at six in the morning! Any liquids you bring through the security line (and this includes things like deodorant gels, hair products, toothpaste, etc.) have to fit in 1-quart plastic Ziploc bag and each product has to be less than 3.4 ounces (100 ml). You can only have a single quart bag. 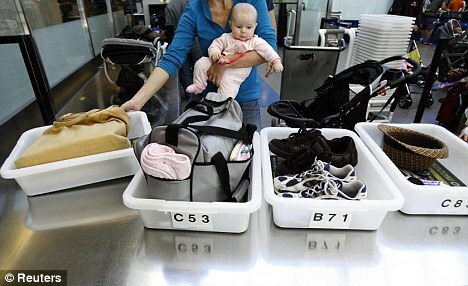 Larger liquids like medications or breast milk can go through security but you have to declare these to the TSA agents and they may examine them more closely. There are few things more frustrating than watching someone in front of you in the security line pull individual items out of their suitcase and dump them into the bin that goes through the x-ray machine knowing that the agent is going to make them do it all over again and put the stuff in a bag. It just slows everything down. Some TSA stations actually provide plastic bags but don’t count on it. Bring a bag from home already! (Kongo carries an extra Ziploc bag or two just in case a bag tears or the Ziploc feature breaks mid-journey) An important clue here—the liquids must be in a container that is 100 ml or less so you can’t have what you think is 75 ml of whatever in a 500 ml container. TSA is not going to measure your liquid. If it’s not in the right sized container it’s going in the trash. Laptops have to come out and go in a separate bin all by itself. Interestingly, cell phones, iPods, iPads, Blackberrys, DVD players, cameras, chargers, plugs, connecting wires, and other electronic devices can stay in your briefcase or carry-on. I know, I know, I don’t understand that either but that’s the rule so be prepared. You are going to have to put your wallet in the bin. Kongo tried carrying his through the scanner one time and held it up over his head like a good little monkey but the agents then went through the wallet and counted credit cards. Now Kongo just sticks his wallet along with his watch in a shoe and places his sport coat or outer garment on top of it. When you’re standing in line and inching your way up to the tables where you have to put the bins and your other luggage and shove them into the x-ray machine you can speed the line up by pulling your computer out of your briefcase, grabbing your liquid bag out of wherever you store it, have your jewelry off, and your pockets emptied. And, oh by the way, TSA agents are loath to touch your bags for fear of being accused if something goes missing at the x-ray machine. And the person behind you doesn’t want to touch your bags either. So, please stay with your bag until it disappears through the machine. Sometimes they back up the conveyor and your bag gets pushed back out so don’t scamper through the scanner until you are sure your bag is going to make it through. It really, really helps if you think about what you’re going to have to take off before you come to the airport so that you can organize your stuff to speed up getting through that line. Before you even get to the scanners and x-ray machines you have to show your documents to an agent. You must have a valid boarding pass and a current government issued identification with your picture on it such as a valid driver’s license, a military ID card, passport, or state issued identity card. AARP membership cards, library cards, Costco membership cards, or a gift card from your local car wash isn’t going to hack it. It doesn’t matter that you just showed your ID to get a boarding pass or to check your bags; you still have to present this ID to the agent. There is nothing more likely to start a chain reaction of eye rolling and deep sighs among those behind you than presenting yourself to the agent and start fumbling around in your purse or luggage for your ID. I mean, come one, what have you been doing while you were standing in line? Now, as a fashion statement, those dorky pouches worn around your neck with your ID and boarding pass visible through plastic covers and heavily favored by travelers over 70 just screams “I have no idea what I am doing here” to everyone around you. If you have a chance, avoid these people at all costs, particularly when they start moving toward the x-ray machines. There’s a great scene in “Up and Away” when George Clooney advises his younger colleague to avoid families and senior travelers when passing through security lines. If you’re a frequent traveler you know too well how sage that advice is. All of us will eventually be senior travelers and hopefully we all get to travel with our families on occasion but if you’re heading out for a routine business trip certain types of travelers must be avoided at all costs. A savvy monkey scans the lines ahead of time to see who is going through (and who is holding things up), which TSA agents seem to be getting qualified in reading the x-ray machines, which lines are broadcasting that dreaded phrase “bag check!” which lines have a group of middle school children going on a field trip, and where the babies are congregating. Speaking of babies and security lines, there is nothing sadder (in Kongo’s opinion) than a mother traveling alone with an infant and who must juggle strollers, car seats, baby bottles, diaper bags, and carry on luggage all at the same time. It’s no wonder with all these distractions that you sometimes read about a baby getting a ride through the x-ray machine. This poor soul will need more time going through the line and there is nothing, absolutely nothing, that anyone can do about it. If you end up behind such a traveler, despite your best planning techniques, just go with the flow and do what you can to help out. Kongo has had strange babies spit up on him while holding infants as mommy juggles all the stuff and the world didn’t come to an end. Just be nice about it and you’ll feel better on the other side. When you make it past security you have to get to your gate but if you’ve done your research in advance and planned well, you have some time to kill. If you are a very frequent traveler you probably have a pass to one of the airline lounges and this is where Kongo spends a lot of his time between security and boarding. If you have a long time before your flight, consider purchasing a day pass. It might seem pricy but remember that you get free drinks and snacks, a Wi-Fi connection, desk space, television, cleaner restrooms, and comfortable chairs to park yourself at. Most airports have art or cultural exhibits (see Kongo’s post about a long layover at ATL), shopping (MSP and LHR are great shopping airports), and other activities to while away your time particularly if you find your flight delayed. A special pet peeve of Kongo’s is certain types of young people traveling in groups. There is an undeniable psychological phenomena associated with these herds that seems to drive them to behave badly and as a group they tend to sink to the level of their most immature member despite the best intentions of the chaperones (God bless them). Anyone who has travelled during Spring Break or field trip season to Washington DC knows what I’m talking about. 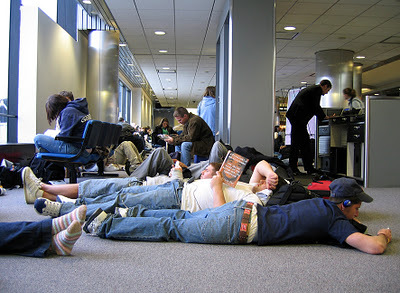 While many aspects of this group behavior is often annoying a particularly irksome habit of these young travelers is a tendency to plop down (with their ever-present pillows) on the floor and sprawl in large bunches in front of departure gates or in main passageways blocking passage, clobbering public space, and generally pushing out other travelers. Chaperones seem oblivious to the inconvenience this activity imposes upon other travelers probably because they can at least see all of their charges and just happy that they’re not running amok or getting into some other sort of mischief. Pre-travel meetings where airport etiquette is addressed would probably go a long way to making everyone’s travel experience more enjoyable. Boarding. The packing, the trip to the airport, the checking of bags, the navigation of security lines, and the passage through the airport culminates in actually boarding the airplane. Airlines have yet to figure out how to efficiently board the hundred or so passengers that are usually queued up for every flight so stand by for other opportunities to lose your cool and take a deep breath as you approach the gate. You either end up in a cattle call scenario imposed by airlines like Southwest or you end up in a rugby scrum with everyone trying get close to the departure door at the same time despite the zone number they have been assigned. Most airlines are going to board the limp, lame, and lazy first. While many of these travelers do indeed need a little extra time to get on the plane and get settled, Kongo almost always observes perfectly mobile and spry travelers crowding forward to be one of the first on the plane. Why you would want to get on the plane first and then sit in a cramped seat for another 30-40 minutes before pushback is another issue altogether but it seems to Kongo that it goes to an unwarranted sense of entitlement and general cluelessness. Kongo has noticed that often these pushy travelers speak different languages than most people in America so perhaps it’s a cultural or language misunderstanding thing but it is very annoying. Civilized monkeys should board in their turn. Nobody is going to get to their destination any quicker than anyone else so why start with the angst early? After the families and disabled are aboard, the airline will call first class passengers. Please, if you didn’t get an upgrade or buy a first class ticket (does anyone actually do that anymore?) please don’t crowd the gate and cause people to push through. Part of this behavior flows from the very plausible fear (entirely the result of greedy airline policies) that there won’t be overhead bin space at your seat and you will end up with your bag several rows behind you or that you will have to check your carry on. Since the airlines began charging for checked luggage the amount of travelers bringing carry on baggage aboard the plane has skyrocketed. 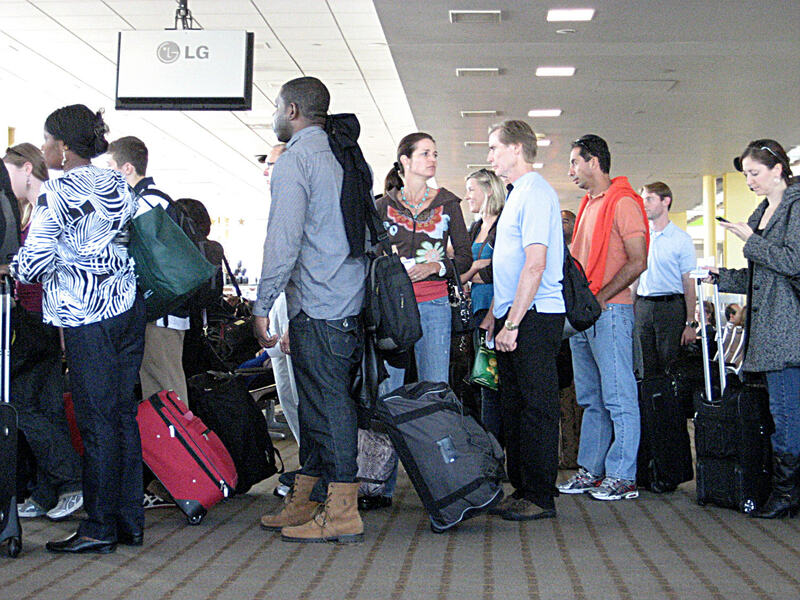 Since almost ALL of the planes now are completely full there will never be enough room for all the carry on baggage and those with the least favorable boarding rights (cheapest tickets) will often not be able to stuff their bag in the overhead and end up slowing the departure while the bag removed stowed in the cargo compartment. Kongo feels that if anyone ever actually solves the boarding problem that they should get a round-trip first class ticket to Oslo and be awarded the Nobel Peace Prize! Airports are great places to people watch, a favorite Kongo pastime. Logos on t-shirts, spiky hair, body piercings, general deportment, arrogance, cluelessness, frustration, confusion, rudeness, soldiers coming home and heading overseas, acts of kindness, and adults wearing pajamas are all wrapped up and knitted together in airports. It’s a fascinating part of modern culture. Just know the rules. And play by them. Future blogs will look at Kongo’s Jungle Rules for being on airplanes, getting rental cars, and hotels. Hi, Anita. Just read your great posts about Prague. We’re heading there in September for the first time and can hardly wait. Thanks for the great insights on the out of the way spots. Cheers! I did however expertise a few technical issues using this site, since I experienced to reload the website many times previous to I could get it to load correctly. I had been wondering if your web hosting is OK? Not that I’m complaining, but sluggish loading instances times will sometimes affect your placement in google and could damage your quality score if ads and marketing with Adwords. Anyway I am adding this RSS to my e-mail and could look out for much more of your respective interesting content. Make sure you update this again soon.. So sorry that you’re having difficulty. The site is hosted by WordPress so if they are having problems it would carry over. I do hope you continue to check in on Kongo! Fantastic goods from you, man. I have understand your stuff previous to and you are just extremely magnificent. I really like what you’ve acquired here, certainly like what you’re saying and the way in which you say it. You make it entertaining and you still take care of to keep it wise. I can’t wait to read far more from you. This is actually a terrific web site. Every weekend i used to visit this web site, as i want enjoyment, for the reason that this this website conations actually good funny stuff too. I’ve been exploring for a bit for any high-quality articles or blog posts on this sort of area . Exploring in Yahoo I at last stumbled upon this site. Reading this info So i’m happy to convey that I have an incredibly good uncanny feeling I discovered just what I needed. I most certainly will make certain to do not forget this website and give it a look regularly. Hello my friend! I want to say that this post is awesome, nice written and include approximately all significant infos. I would like to see more posts like this . Hi there! I know this is kinda off topic however I’d figured I’d ask. Would you be interested in exchanging links or maybe guest writing a blog post or vice-versa? My blog addresses a lot of the same topics as yours and I think we could greatly benefit from each other. If you happen to be interested feel free to shoot me an e-mail. I look forward to hearing from you! Fantastic blog by the way! Good idea. Will email you in the next day or so. Glad you like the blog. It’s a free theme from WordPress called Twenty Eleven. Easy to tweak. Good luck. Sometimes I get caught up in the fun of a game which frequently keeps me from winning. excellent post, very informative. I wonder why the other experts of this sector do not notice this. You should continue your writing. I’m confident, you’ve a great readers’ base already! You could certainly see your skills within the work you write. The sector hopes for even more passionate writers such as you who are not afraid to say how they believe. Always follow your heart. I would be thrilled. Have at it. Keep up the wonderful work, I read few content on this site and I conceive that your web site is very interesting and has lots of good info. Wonderful read! The bit about the herds of young people is a hoot! Also, I’ve observed the varied queuing mores abroad; it’s definitely a cultural thing, in my opinion. Finally, I love, love, love people-watching in the airport, too! I like this site because so much useful material on here. Great write-up on travel! I also travel a lot, mostly in Europe though. I have massive pet peeves; the people that walk in a security line and then look shocked when they have to take their laptop out or belt off – c’mon people! Great post! Magnificent web site. Lots of helpful information here. I’m sending it to some friends ans also sharing in delicious. And obviously, thanks on your sweat! Sheer Eloquence. If only the world would adhere. Thank you! And thanks for visiting. Kongo is such a smart monkey! Please visit the web pages we adhere to, which includes this one particular, because it represents our picks in the web. Every once in a when we pick out blogs that we study. Listed beneath would be the latest internet sites that we choose.